Needing a model between the 75 Motor Yacht and the 62 Flybridge, Princess designed the F70 Motor Yacht as a stepping stone to the larger Y-class series. 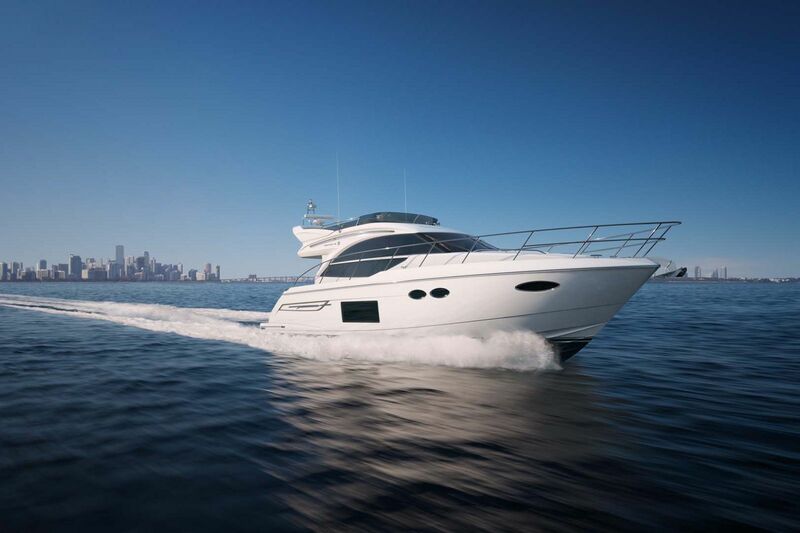 As a result, the F70 Flybridge Motor Yacht has become one of the most popular Princess models in the U.S. market for its perfect proportions, amenities seen on much larger yachts, and a unique interior design that places the galley aft so that both the dining area and aft cockpit can be directly served through the electrically opened aft window. There is plenty of opportunity on the 68MY for outdoor living spaces that are enhanced with comfortable seating and dining areas, but the interior is not to be overlooked. With a bright, airy feeling due to the large windows, the interior of the 70 is just as intriguing. Between the flybridge amenities, the aft galley, the superior performance, and the overall styling of the yacht, the new 70MY just feels different. The bow and transom of the 70 Motor Yacht may be at opposite ends of the boat, but they both provide fantastic places to lounge outdoors. The bow foredeck has an excellent seating arrangement where guests can either sunbath or enjoy the ride when underway. Similarly, the transom swim platform is on a hydraulic lift that lowers down into the water for a refreshing dip while lounging on your own private teak beach area. Staying outdoors but getting out of the sun is easy between the flybridge and the aft cockpit which is shaded by the bridge overhang. The U-shaped seat and teak table with built-in cup holders is a great option to enjoy the view or dine al fresco and the convenience of the aft galley and electric window makes serving guests a breeze. The flybridge on the 70MY is a top selling feature and one of the main reasons why the model has done so well in the U.S. market. Aft-facing sunpads line the back of the flybridge and are adjacent to the U-shaped sofas and dining table. Portside is a flybridge wetbar complete with icemaker and storage for refreshments. Captains will enjoy the visibility from the flybridge helm and in the L-shaped guest seating next to the helm. The salon of the F70 Motor Yacht is spacious and bright with a pair of couches on each side under massive windows. The galley placed aft means that the chef on board can be a part of the fun while everyone is in the salon, dining area, or on the aft cockpit. The dining area can easily fit 6 to 8 people at the table and is placed starboard side from the galley. The dining area being so close to the salon doors provides a great breeze and outdoor feeling that guests will love. The standard power package on the F70 Motor Yacht is a pair of Caterpillar C-18 ACERT 1,150hp diesel engines that push the boat to a top speed of 30-32 knots and a cruising speed of 26 to 27 knots. An optional upgrade for owners is the MAN V12 1,400hp engines which provide a slightly higher cruising and top end speed. 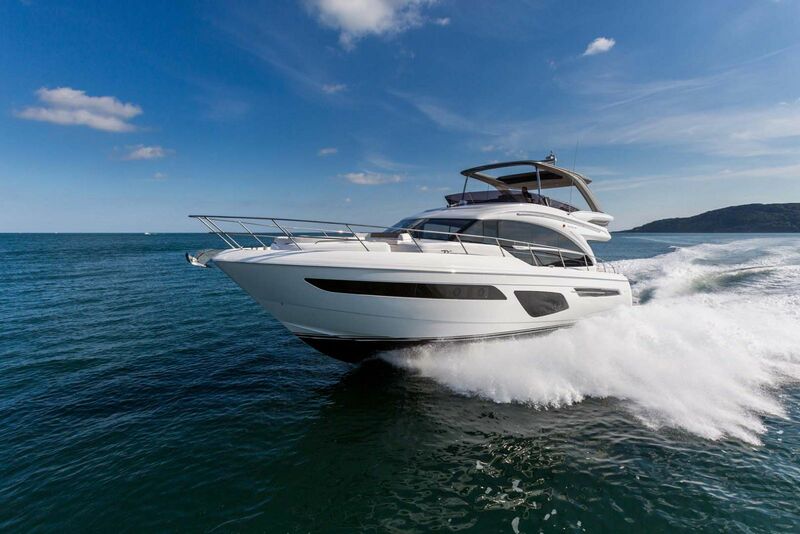 For more information on the Princess Yachts F70 Flybridge Motor Yacht, contact your Staten Island Yacht Sales Professional today.